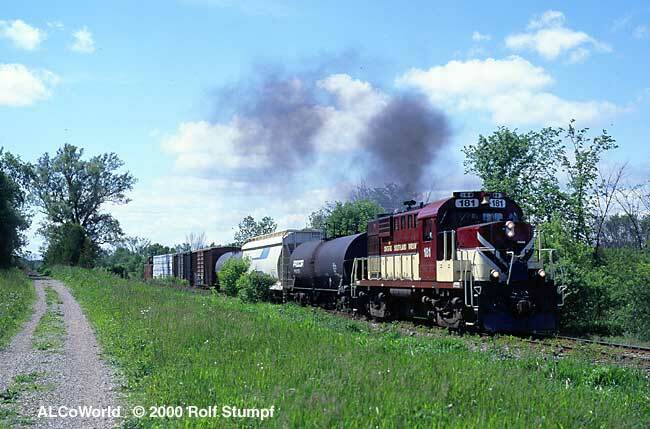 181 shows muscle with six cars and a caboose nearing Guelph Jct., June 2nd, 2000. 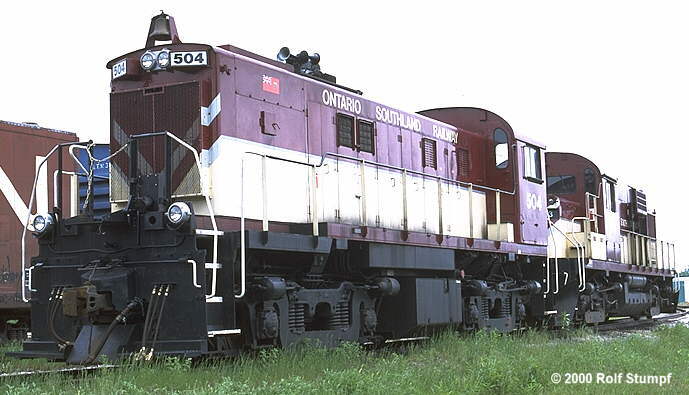 The Guelph Juction Railway is owned by the city of Guleph but is operated by the Ontario Southland Railway. The caboose used on the line is lettered for the GJR, but numbered OSRX 4900. The line starts at the CP at Guelph Jct. and runs north to Guelph, where 3 miles on CPR's Goderich Subdivision within Guelph are served as well. Greg McDonnell, Feb 5th, 2001: I was by the Guelph Jct. Ry today, they've got RS23's 504-505 on the train now. They sound fantastic! RS18 181 has returned from repairs and 502 is still on hand. 504 (MLW RS23) and 183 (MLW RS18) at Guelph Junction, June 2nd, 2000.